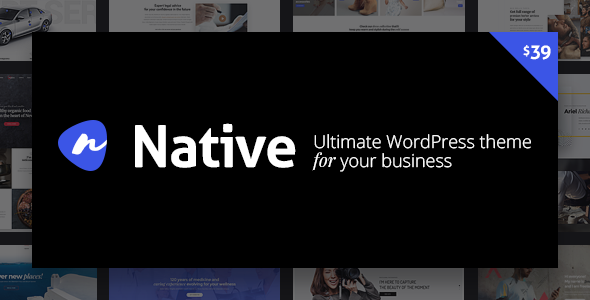 Native — Stylish Multipurpose Creative Corporate Wordpress Theme is your number 1 choice if you need to build a unique stylish website. 40+ creative, corporate, blog, portfolio, gallery, shop, onepage pre-built demos with one-click demo installation feature and bundled WPBakery Page Builder, Slider Revolution and other premium plugins will allow you to get your project done easy and fast. Drug-n-drop visual page builder with frontend editor and 60+ DFD custom shortcodes allow to build any page you want. Advanced responsive options will make your page mobile friendly. Powerful theme options panel provides control of every page type, taxonomy, header and many more. Choose one of Restaurant, Lawyer, Agency, Health Care, Shop, Fitness, App, Blog, News, Portfolio, Onepage demo or build your own one. Our extended theme documentation and video tutorials will help you to find the answers for all of your questions and even if you need something that is not described there or you simply need assistance our friendly customers’ support confirmed by lots of customers’ reviews will do their best to provide you with the solution you need as fast as possible. 1. Admin notes dismissable option added. 1. Pricing list shortcode "Currency symbol position" bug fixed. 1. Video background on Login page bug fixed. 2. Visual Composer updated to 5.2.1 version. 3. Facebook counter bug fixed. 4. Shopping cart displaying bug fixed. 4. Row background in Ultimate addons bug fixed. 1. WPBakery Visual Composer 5.2 compatibility issue solved. 1. WPBakery Visual Composer 5.2 compatibility added. 2. RTL mode "warning" removed. 3. Multilayer Vertical Parallax background position option in row settings added. 4. Appear animation effect of Tabs shortcode bug fixed. 5. Single image and Blog posts retina display bugs fixed. 1. Simple style footer section on One Page scroll template added. 3. "Shuffle style" on Animated text shortcode bug fixed. 4. Style tags on single product fixed. 5. Retina logo issue solved. 6. Slider Revolution plugin update included. 2. Fix: WooCommerce variable product images bug fixed. 1. New: RTL support added. 2. Fix: Header builder bug fixed. 1. Fix: Contact form module bug fixed. 2. Fix: Custom fonts uploader bug fixed. 3. Fix: Header login form conflict with header builder fixed. 1. Fix: Redux editor field fix. 2. New: Portfolio and gallery module thumb size options added. 3. New: Back to top button styling options added. 4. New: Info box module hover option added. 5. Fix: One page scroll background bug fixed. 6. Fix: Portfolio and gallery image sizing improved. 7. Fix: Lightbox buttons vertical alignment veiw improved. 8. Fix: Facts module bug fixed. 9. Fix: Instagram color changed. 10. Fix: Portfolio fullscreen IE11/EDGE on Windows 7 bug fixed. 11. Fix: Image carousel IE11/EDGE on Windows 7 bug fixed. 12. Fix: One page scroll appear effects fixed. 1. New: New demo added. 2. New: Demo data for shortcodes added. 3. Fix: Google Maps IE bug fixed. 4. Fix: Image module hover bug fixed. 5. Fix: Team member module bug fixed. 6. Fix: Gradient button module bug fixed. 2. Fix: Gradient button bug fixed. 3. Fix: Modal box bug fixed. 2. New: Admin area custom CSS option added. 5. Fix: Related posts thumbnail bug fixed. 6. Fix: Twitter shortcode title alignment bug fixed. 7. Fix: Icon manager wp_filesystem call bug fix. 1. New: New demo addded. 2. New: Lazy images load fetaure added for shortcodes. 3. New: vk and odnoklassniki social networks added. 4. New: Mobile menu subitems trigger styles changed. 5. Fix: Side header menu dropdowns bug fixed. 1. Fix: Custom fonts notice fixed. 2. Fix: Rotate box module animation improved. 1. Fix: json_decode error fixed in icon manager extension while demo data installation. 2. One page scroll template Firefox bug fixed.